Today, we meet Mahler. More accurately, we take a walk in the composer’s footsteps, indirectly, through the historic recordings of two of his closest protégés, soprano Anna von Mildenburg and conductor Bruno Walter. One brief fragment from 1904 is the only existing document of the eminent Austrian Wagnerian soprano, Anna von Mildenburg (1872-1947), pictured above. 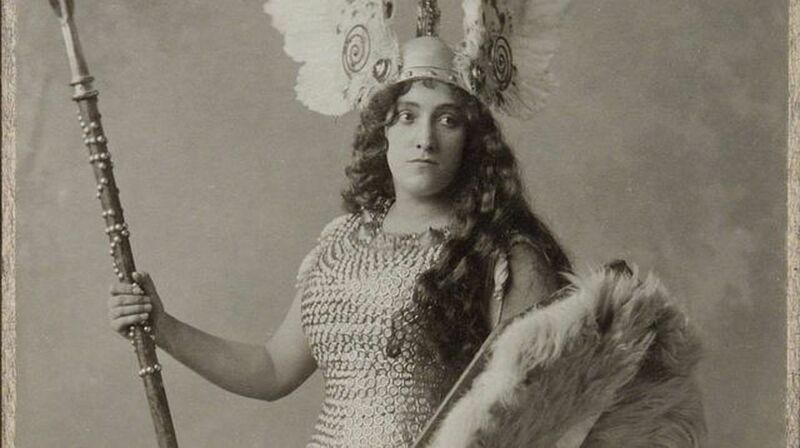 At the age of 23, Mildenburg made her debut under Mahler’s baton at the Hamburg State Opera, singing the role of Brünnhilde in Wagner’s Ring Cycle. Mahler nurtured Mildenburg’s talent and developed a close relationship with her during his tenure in Hamburg. Later, he helped establish her career in Vienna. Demonic, wildly grotesque, bizarre, comical, unique- that is how people regarded him. Many had an eerie feeling on seeing him at the podium. They sensed an extraordinary power and backed away as if from something threatening, or stood and stared at him inquisitively with a pleasurable thrill…I see him now, suddenly standing still with mysterious gestures in the middle of a walk and, with bated breath and a quiet smile, avidly watching a small animal at work, listening to a bird singing. This serenity aways gave way to reflection and serious, pensive contemplation, an awareness of God’s wisdom, will and wonder. He always felt the miracle and the mystery, awestruck and with a touchingly childlike astonishment. He could not understand Man’s indifference to these wondrous acts of nature. How joyful and happy, how grateful he could be, when he infected someone else with his enthusiasm, an enthusiasm for nature or for art, for all that was beautiful. But too often he wrestled in vain, squandering his best efforts. I felt as if a higher realm had opened up to me- Mahler, in looks and behavior, struck me as a genius, a demon; life itself had suddenly become romantic. I cannot better describe the elemental power of Mahler’s personality than by saying that its irresistible effect on a young musician was to produce in him…an entirely new attitude to life. Great post, Tim! I keep hoping to find video of Mahler conducting some day. I’d love to have played under him! It would have been an amazing, and probably frightening, experience playing under Mahler! According to Mahler in this music ‘the dark forces hold sway’. Tumbling triplets bring the movement scurrying to its end with a sense of dread that would be only be allayed by the relief and redemption inherent in the music that was to follow after a few minutes respite: though not the five minutes Mahler specified. Bychkov encouraged a charming gentle lilt to the Ländler of the Andante moderato and it was as ‘Schubertian’ as Mahler requested. The third movement is an orchestral version of Mahler’s song from Des Knaben Wunderhorn in which St Anthony preaches to fishes who – despite seeming to listen to what he says – return to their sinful ways when he has finished. Bychkov paced it perfectly according to Mahler’s instructions ‘In ruhig fliessender Bewegung’ (Calmly flowing) while not downplaying the acerbity there is from the woodwind.